​SkyTeam, the global airline alliance has launched a new metasearch tool on its website making it easier for customers to plan and book trips on all 20 member airlines. SkyTeam is the first airline alliance to offer a comprehensive flight search tool that harnesses the full scope of its global network, showing real-time availability, schedule and pricing information across 1,074 destinations with clearly displayed results all in one place. The metasearch aggregates all the flight options for the customer from the 20 member airlines,which are then all displayed on one page. The customer selects the preferred trip from real-time price, schedule, availability, and routing, and is then redirected to the chosen airline's website to complete the purchase. "Find Flights is the most used online function for the millions of unique visitors to our site each year, the majority of whom tell us they want to book travel online with ease," said Kristin Colvile, SkyTeam's Chief Executive Officer. 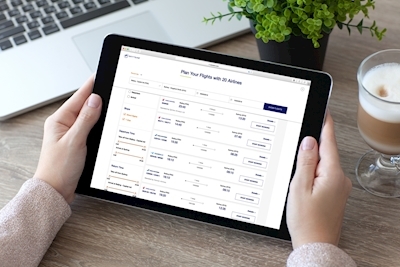 "SkyTeam's latest technology innovation meets customers' needs by delivering a tool that simplifies searching for flights onlinewhile making it easier to earn Frequent Flyer miles by booking within our alliance." In June, SkyTeam unveiled the SkyLink Digital Spine. The Spine bridges technology differences between members to make it easier for customers to book ancillary products – such as preferred seats - across different airlines on one itinerary. At the airport SkyTeam Rebooking, an industry-leading tool to minimize the inconvenience of flight delays and cancellations is getting customers on their way more quickly. Meanwhile, SkyTeam's airport maps, available on the free SkyTeam app, are helping customers navigate airports, reducing stress and making their transfers smoother.